Let me begin by stating that this not a small by any means. Measuring a whopping 47.4mm in diameter, 51.2mm from lug to lug (if you can call them lugs) and 16mm thick. However, its size doesn’t make it uncomfortable, on the contrary this is by far the most comfortable +44mm watch I’ve ever worn. Do not get me wrong, you still know you have it on ALL THE TIME, but I attribute that to its incredible heft. At 220g on the stainless steel bracelet (I just weighed mine at 208g with 3 links removed) and 130g on the rubber strap, this is a very heavy watch. Many people would look at this as a negative, but as I stated in the intro, I like hefty watches. IMO, It’s nice to know you have something with substance on your wrist. And the bonus is that you can use it as brass knuckles or a hammer in case of an emergency, not that you would want to do that… But the possibility is there. It is entirely made up of silky brushed stainless steel, except for the pushers, which are polished. 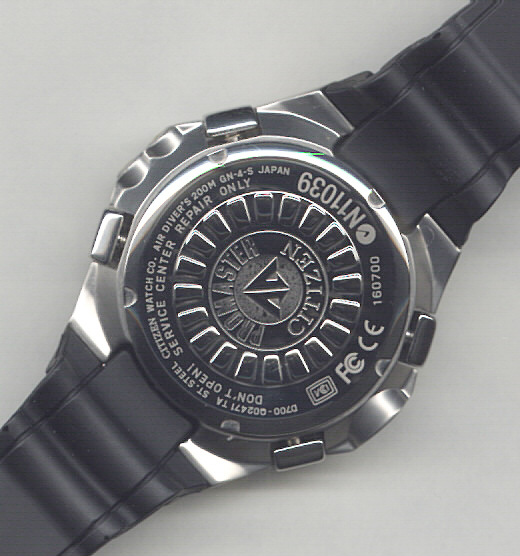 The Bezel is also brushed and is engraved SEL, SET, MODE and SUB-M opposite each respective pusher. There is no crown to this watch, why would it need one, instead on each side of the case you can find a specific feature. The turbine looking thing on the left is the depth sensor and according to the manual this watch is set up to calculate accurate depths in salt water only. If I’m not mistaken, you must multiply the number indicated on the dial by factor of 1.05 in order to get an accurate depth rating in fresh water. On the other side, the 2 gold dots are terminal contacts. One is for charging the watch and it is also a water sensor (temperature) and the other is the data transfer connector. 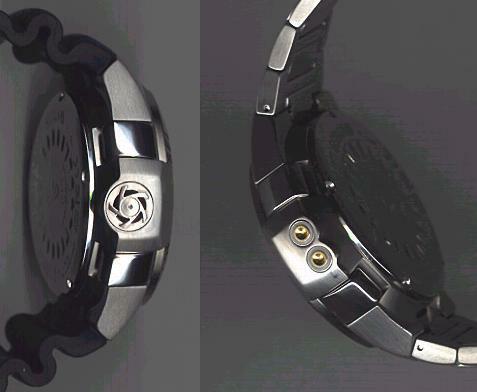 Both of these are activated by the charging/data transfer cradle, which is supplied with the watch. The case back is VERY impressive for a Citizen watch. On my SkyHawk, the case back was flat with no deep engraving or any embedded details. 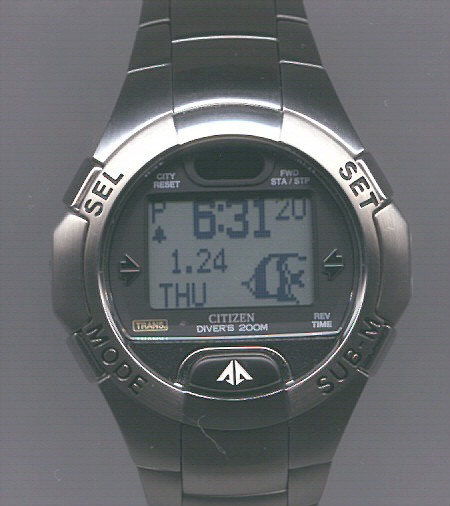 This one is very thick, with a circular rigged design surrounding the engraved Citizen Promaster logo. The rest of the engraving is light, sort of looks like laser etched writing. It is written: ST. STEEL CITIZEN WATCH CO. AIR DIVER’S 200M JAPAN. Along with, in bigger letters, DON’T OPEN! SERVICE CENTER REPAIR ONLY. And of course the proper identification numbers and serial numbers. I seriously question the reasoning behind writing “DON’T OPEN!” on the case back. Would it not have been enough to put it in the manual, along with all the other warnings? And believe me there are many. The screw down back is a standard case back clamp opening design, which guarantees its water resistance to 200m. More then enough for any professional/recreational diver, keeping in mind that this watch cannot be used for Nitrox diving. The rest of the rear of the watch seems to have a sandblasted finish. Odd since this finish is not found anywhere else on the watch. Unfortunately this type of finish shows scratches almost immediately and while I was putting on the bracelet I added a few, might you they are extremely small. The lugs, are very large and only provides 14mm o space between them. This eliminates any other strap possibilities. 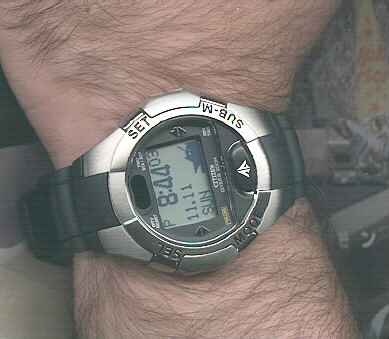 Fortunately, I have both the rubber strap and stainless steel bracelet. I attribute most of this watch’s comfort to the fact that the lugs sit so high up on the case. This alloys the bracelet to look very integrated and it also smoothes out its enormous girth, making it look smaller on your wrist then it actually is.